Are you searching for Astro uncle aka Pawan Sinha on Tez Channel? Then you must check this information now. As per the news, Astrologer Pawan Sinha is now giving their astro tips on India News Channel. Below is the more information about Good luck guru astro program of pawan sinha. Since Few weeks, Pawan sinha is not available on Tez new channle, who earlier doing astrology show "Astro Uncle" and "Pawan Sinha Live" on Tez aaj tak channel. But the good news is, he is back on new channel. The official news is that Astrologer Pawan Sinha will be now available India News (Dipak Chaurasiya fame). Viewers can ask their question to Shri Pawan Sinha ji on India News by below email id. What is show timings of Good Luck Guru? 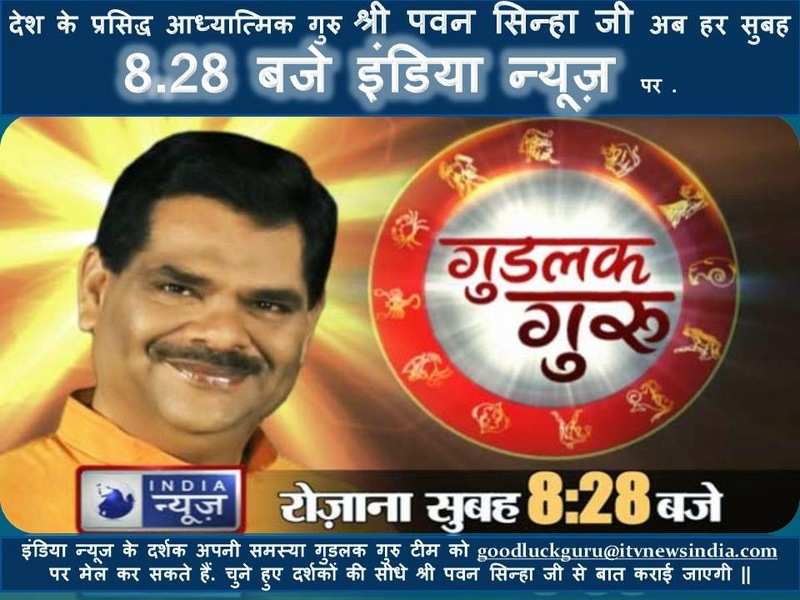 Shri Pawan Sinha ji will daily show their astrology prediction programm on India news at Morning 8.30 Sharp. You can watch their astro show on india news daily 8.30 AM with new name "Good Luck Guru". How to ask Questions to Good Luck Guru? IF you have any question or query and you want solution of that from pawan sinha ji, you can ask your question to pawan sinha on Good Luck Guru Program. you can mail your query at goodluckguru@itvnewsindia.com. For more information do follow us on our facebook page at Good Luck Guru - गुडलक गुरु.